This post contains some affiliate links. This means that if you decide to click on the links and make a purchase, I might receive a small commission (at no extra cost to you) that goes back into helping me keep the blog running. Thank you so much for your support. I love these little fruity chocolate pots. 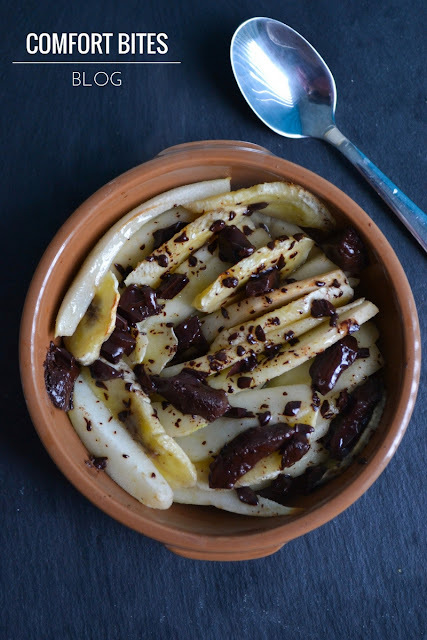 Soft, hot banana and sweet pear baked together with silky, melty dairy-free chocolate. This kind of thing is what makes fruit feel a bit more like a pudding, or dessert. Something cosy, that you need a spoon to eat. It doesn't matter whether it's raining, snowing, blustery gales or whether it's tropical outside. This is the kind of food that's good for the soul. Any day. Get out a small oven proof dish or ramekin and preheat your oven to gas mark 6/200ºC/400ºF. Slice the banana, slightly on the diagonal - and core and slice the pears. Arrange them in the dish, so the banana is evenly distributed among the pear. Take the pieces of chocolate and break them up into smaller pieces, pushing them into the fruit slices. Slide the pot into the oven and bake for around 10 minutes. 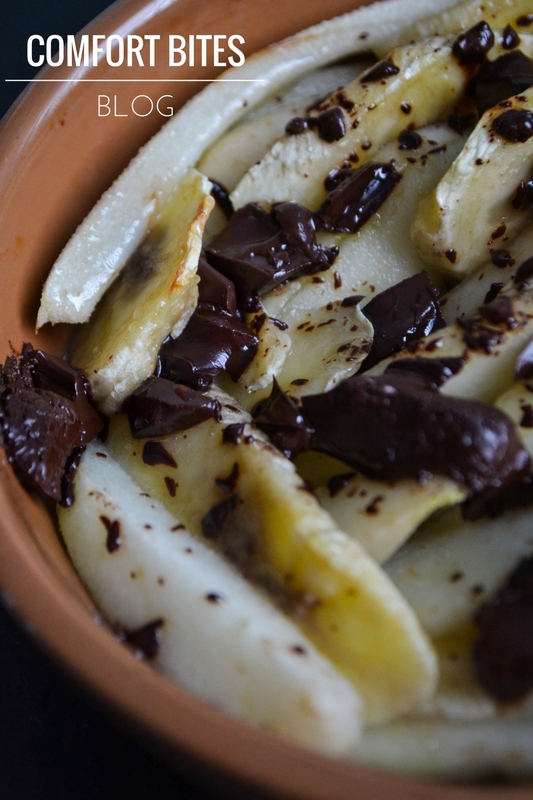 After 10 minutes, the fruit should be softened and aromatic, and the chocolate should just be beginning to melt. This is perfect. Drizzle and glaze with a little honey if you like, and then serve straight away.